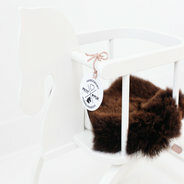 Remember those wooden rocking horses at your grandparents or at home when you were young? Sooo much fun!That joyful feeling was also something Annemarie de Man of Petit Puk had! So she went looking for vintage pieces to refurbish and sell them in her shop. She wasn’t the only one loving rocking horses so it seems. The selling went well. But finding good vintage ones wasn’t easy, so she started thinking of producing them herself. And she managed to find a way and we are big fans! Beautiful handmade birch, if wanted painted in powder pink or powder green. Or in any other colour you wish for a little extra. Of course only childproof materials are being used. And what do you think of that funny and soft sheepskin to go along with it? Awesome as a birth present because you can also personalize it with a nametag. A beautiful, personal and nostalgic present for someone special to give with a group of friends or colleagues. 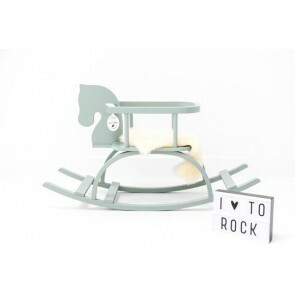 Rocking can be done as of 9 months (when the baby can sit well) till approximately 3 years.